Brrrr! The temps keep dropping in SF. I told you guys I have been obsessed with soups lately, right? My grandma gave me a soup cookbook a while ago, and I have been trying more of the recipes out from it recently because of the cooler weather we have been having here in the city. The last soup recipe I made from it was this red lentil soup. At first I was skeptical because I saw it used red onion instead of yellow onion. 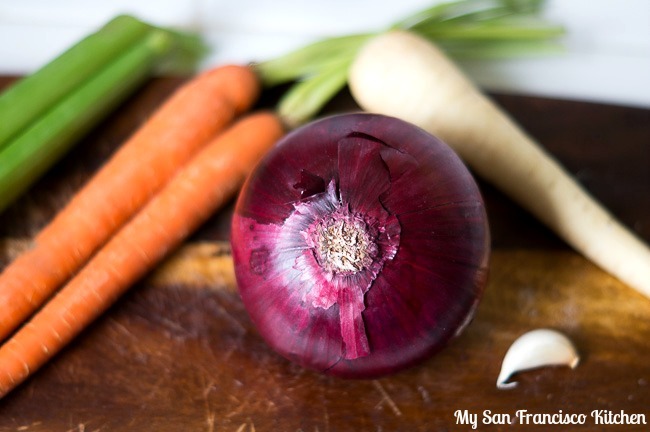 I have never made a soup with only red onion before, so I was worried about how it would turn out. Otherwise, it looked delicious, so I figured why not give it a try! In the end, I didn’t taste the red onion at all. The parsnip gave the soup a really nice flavor, and the lentils created a thick texture. It was delicious! This is my first time participating in the Sunday Supper Movement – the mission to bring back Sunday Supper around the family table in every home through this weekly virtual recipe party. I can’t wait to read other recipes from this week’s Sunday Supper (see below), and share more recipes with you guys in support of this wonderful mission. Heat the olive oil over medium heat in a large pot and add the onion and garlic. Cook for 5 minutes, stirring occasionally. Add the remaining ingredients and bring to a boil. Cover and reduce the heat to low. Simmer for 25 minutes. 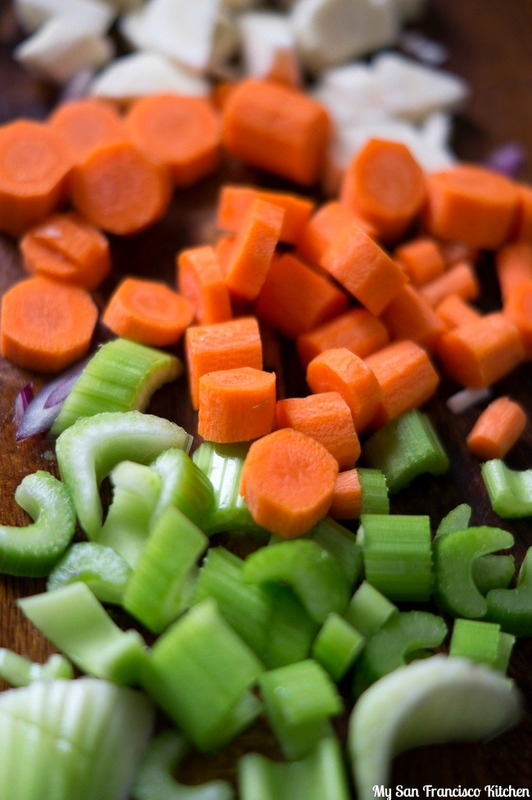 Cool the soup to room temperature, then blend in batches and return to the pot to reheat. This entry was posted in Lunch, Soups, Vegetarian and tagged fall, healthy, lentil, soup. I just bought red lentils…looks like I found a recipe to use them in! We are big red lentil fans here and your recipe is a must try!! Looks amazing! 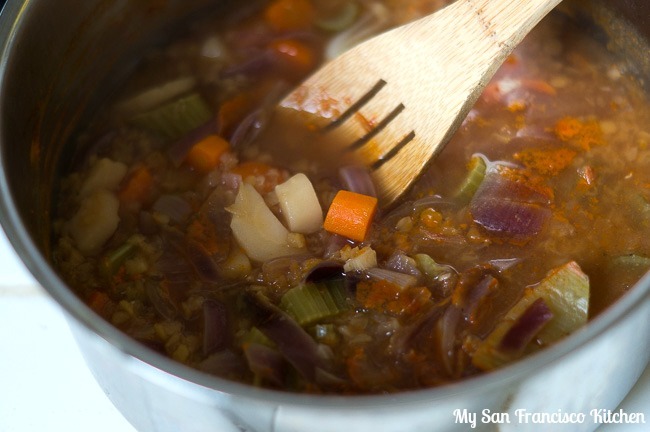 Love this soup and all of those pretty root veggies and lentils! This looks like a great cozy fall dinner! Your soup looks beautiful! I’ve been enjoying soup and chili a lot lately too, even though our temps are still in the 80s! Thanks for telling us about the Sunday Supper Movement. I just signed up to participate! I have got to make this recipe for my vegetarian son! He’s away at college, but I’m thinking I could freeze this in single servings for him to take back to school! So comforting and delicious and creamy smooth love these simple flavors. I am craving a bowl right now. Just pinned! Such a great fall soup recipe, perfect flavors and veggie combo. Thanks! I love this soup! So pretty and hearty! 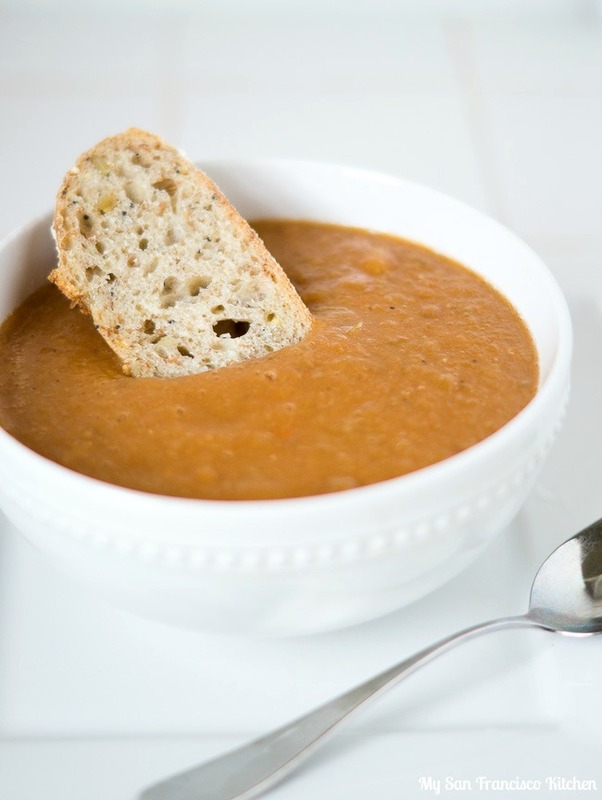 Your soup looks so warming and delicious — and the bread is the perfect companion for dunking! Welcome to Sunday Supper. I just happen to have some red lentils in my cupboards so I know what I am making for Soup Saturday this week. Simple and hearty, my kind of soup!